Western Environmental Liner was created in 2002 by Western Ag Enterprises Inc.,which has been in the fabric manufacturing industry since 1984. Western Environmental Liner was formed in order to better provide geomembrane liners for their growing customer base. Western Environmental Liner specializes in the production of custom fabricated geomembrane linings for all types of applications including very large ponds in all shapes and sizes, canals, temporary construction ponds, manhole linings, waste pits, custom bladders, mining applications, golf course pond water features, recreational facilities, oilfield fuels & waste, concrete embedments, cargo covers, vapor barriers, frac pit liners,frac tank liners, remediation linings, asbestos abatements, fumigation covers, construction enclosures, silage covers, hay tarps, just to name a few. Liner materials include Reinforced Polyethylene, Reinforced Polypropylene, PVCs, Xr5 and Potable drinking water certificated products. They have high UV and puncture resistance and guaranteed to last over 20 years. 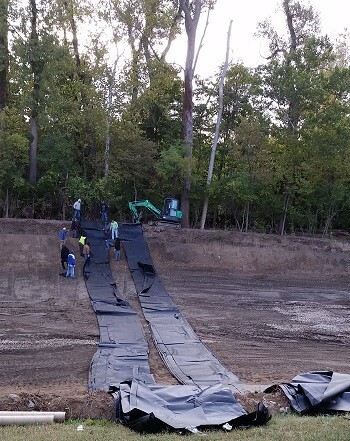 Our geomembrane liners are made up of reinforced liner materials which can be prefabricated or pre-seamed in the factory into larger pieces which will save on liner installation cost. We also use heat to seam it so you are basically melting the liner materials together. We do liner installations worldwide. Please contact a 30+ old geomembrane liner manufacturer for your containment lining project needs.